New York Yankees..... 1930s Priceless copywriten press photograph of Joe Dimaggio at San Franciscos Fishermans wharf kept in DiMaggios San Francisco Home. The news service copywrite forbids the use and reproduction of this photo and was given to Joe just as a gift. 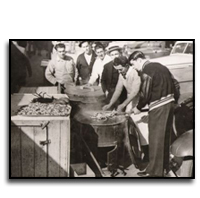 This candid photo shows a young Joe DiMaggio and some of his friends cooking seafood in San Francisco. This photo is in excellent condition, suitable for framing. It is the only one of its kind and Joe actually thought enough of to save for his personal collection. 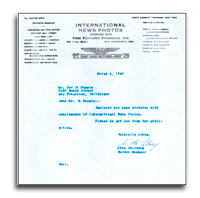 There is also a letter from Otto Stolberg, Bureau manager of International News Photos, dated March 4, 1940. 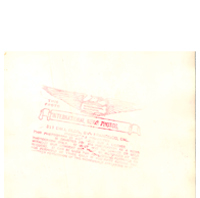 This letter accompanied the photo that was sent by him to Joe. 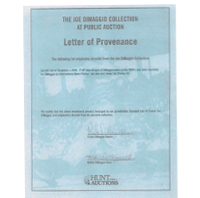 This letter is a valuable item in itself as it contains what was Joes address in San Francisco. The copywrite and the L.O.P. signed by his 2 grandaughters personally comes with this one of kind collectible. This photo is from Joes personal collection. It was owned by JOE DiMAGGIO which means that it was handled by Joe and that in all likelyhood it contains Joes DNA. Truly one of the best Joe DiMaggio collectibles to find.